Owners Viljo and Autumn Basso inside their Coeur d'Alene bistro. 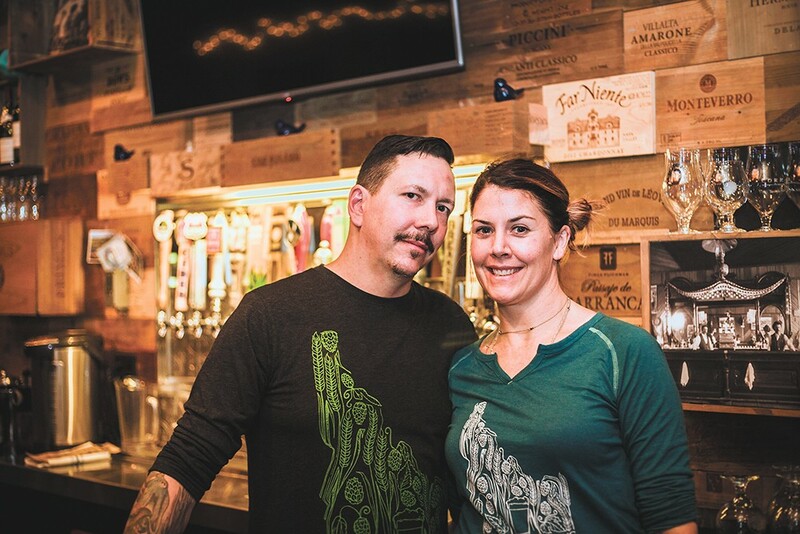 Midtown Bluebird serves the kind of food they like to eat, say restaurant owners Viljo and Autumn Basso, whose travels and living in Seattle and Portland inspired them to start the Coeur d'Alene bistro in May of 2016. Popular items include the mussels in chorizo, octopus with white beans, scallops and their housemade pickle plate. The décor is eclectic, with Old West photos on the walls and funky lighting and seating throughout, the kind of place you might stumble into while exploring Seattle's Ballard neighborhood or wandering Portland's famous Pearl District. The menu puts a Bluebird spin on traditional dining with categories such as "Leafy and Liquid" (salad and soup) and "Forks, Spoons, Knives and Fingers" (entrées). Seasonal dishes span the globe, from spicy Korean bi bim bap with duck confit served in a little kettle to a tater tot "poutine" casserole. True to Chef Viljo's classic cooking background, presentation is a priority, making each dish feel like a special occasion. In addition to being a great place to grab a beer and a snack or meet friends for Sunday night trivia, Midtown Bluebird is also a celebration of community. On the back of Midtown Bluebird's menu is a note to customers expressing appreciation for supporting not only the restaurant, but also its staff, and by extension the local community. "When you eat out," it reads, "just remember your money helps take care of a community... From the servers, cooks, bartenders and dishwashers... to the families of our suppliers." "We like Midtown because it's out of the touristy areas and it is more of a neighborhood feel," says Autumn. The couple's other restaurant, Syringa Sushi and Café Bar, is also in Midtown, a loosely defined neighborhood along Coeur d'Alene's Fourth Street corridor with a mixture of restaurants, small businesses, thrift shops and residences. "We are seeing new places opening and more people supporting the established business," says Autumn. "We're thankful for our community and appreciate being recognized."